This month is Childhood Cancer Awareness month. It’s a cause that hits really close to home to me because it hit my home as a first time new mom. I wrote about our experiences last September. At that point we were just 2 months into our son, Charlie’s, treatment. If you’d like feel free to read my blog post from last year, but I will briefly summarize our son’s diagnosis. My son was born May 5, 2013 – healthy, normal, happy baby boy. At 6 weeks old I started noticing a strange glow in his eye in certain lighting. It was just a flash, and very hard to replicate. We also noticed a strange glow in his eye while taking pictures of him with the flash on. It glowed white instead of the normal red. Call it mother’s intuition, the prodding of the Holy Spirit (I think both), but we made an appointment with a specialist at Riley Children’s hospital. July 19th, 2013 was the day our world was turned upside down. We were told that our 11 week old baby had Retinoblastoma (a rare eye cancer… read more about by clicking). A level D tumor in his right eye (second to the largest). Typically they would have removed his eye, but they felt he was too young. Our only other option was chemo. Hearing the news, and wondering what the next few months would hold for our son was the most gut-wrenching pain I’ve ever experienced. The next week was filled with an MRI, an eye exam under anesthesia, central line placement, and two days of chemo. We were also given a crash course on central line care which was incredibly intense, especially for two people with no medical background. If a central line is not cared for properly, it could cause a fatal infection for someone especially with virtually no immune system. So, that’s where my last post left off. We were new to this cancer parent club, but beginning to get our feet under us. 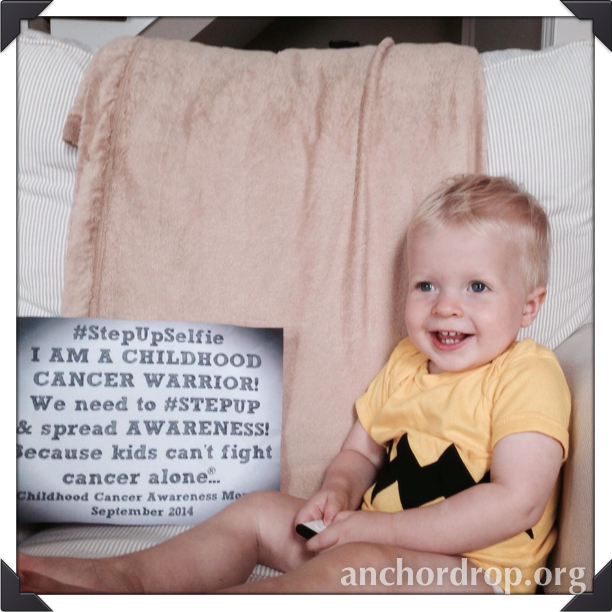 At the end of September, Charlie had his first exam under anesthesia since beginning treatment. At our last visit we were told Charlie had a 0% chance of keeping his eye, his retina had fully detached, and therefore he wouldn’t ever have vision in that eye. We were just buying time to keep the cancer at bay until he was old enough to have his eye removed. Well, the exam in September told a much different story. His tumor had shrunk dramatically and his retina spontaneously reattached!!! This was an amazing miracle! There is no medical explanation for retina reattachment. The only explanation I have is God. This was incredible news, but we still had a long road ahead of us. Our next hurdle was genetic testing. There are two kinds of retinoblastoma: unilateral (one eye/typically not genetic) and bilateral (both eyes/genetic/more aggressive/possibility of sarcoma type cancers in the future). We had the genetic testing done, and it came back that he does not carry the RB1 gene! Such another amazing praise and another huge sigh of relief! The next few months brought a total of 6 rounds of chemo, 11 blood/platelet transfusions, and 73 – three hour long infusions pumped through his central line at home. 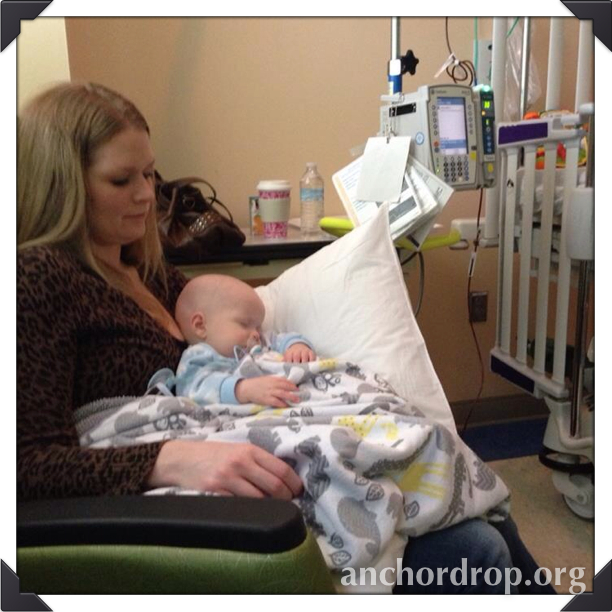 Amazingly Charlie never had any fevers, infections or colds. That is pretty much unheard of when someone is receiving chemo. Charlie also had very minimal side-effects of from the chemo, just threw up a handful of times. God was really protecting this little guy. The time went by fairly fast even though we were homebound. Scott, my husband, would still go to work and the grocery store for us, but that was it except for Dr.’s appointments. Charlie and I never left the house for 6 months. People have asked, “How could you do that?” “That must have been so hard”. It was, but it wasn’t. When you are faced with the alternative that your son could be admitted to the hospital with a life-threatening infection or cold, suddenly Target runs become less important. It was worth it to protect him. I also can say for the most part, our time was joyful. We did have moments of tears, anxieties, frustrations, and self-pity, but I can honestly say it was very minimal. Again, the only explanation I have is God. How could one be joyful in a time so dark as this? 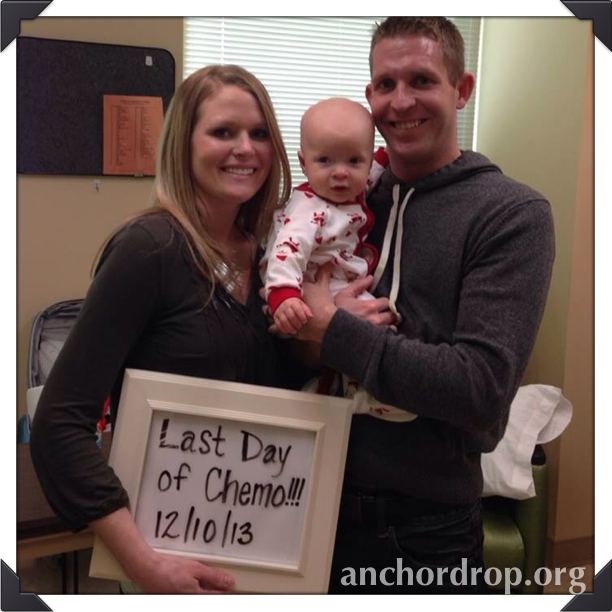 We finished our last day of chemo December 11th – what a great Christmas gift! 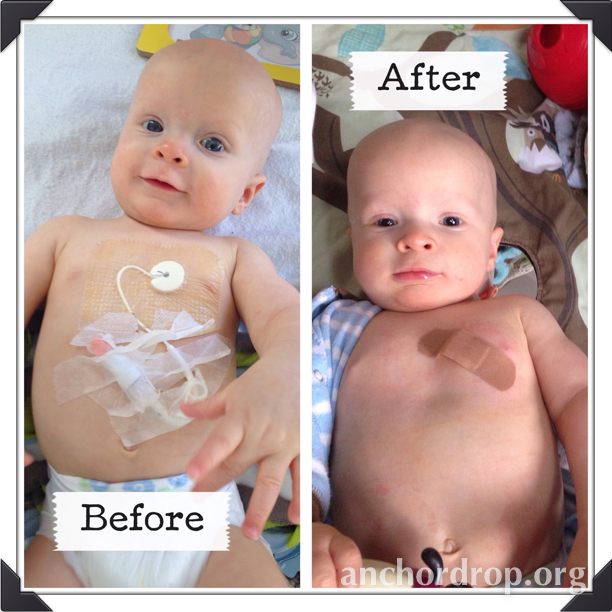 In January we had our baseline follow-up with another exam under anesthesia, and everything looked great. We were given the green light to start patching his good eye in order to see what kind of vision, if any, was in his bad eye. You see, even though his retina reattached, his tumor was so large that based on what the Dr. saw he thought it still could have damaged his vision. I had high hopes that he would see to of that eye immediately, and things would be great. This unfortunately was not the case. It was very difficult to watch Charlie’s happy demeanor change to nothingness every time we patched him. He would hang his head, and sometimes fall asleep. He would not respond at all to Scott or I visually and that was pretty heartbreaking. It seemed cruel to me to be putting him through this, but we knew we had to stay with it. We began to pray. Jesus healed the blind in the Bible, right? 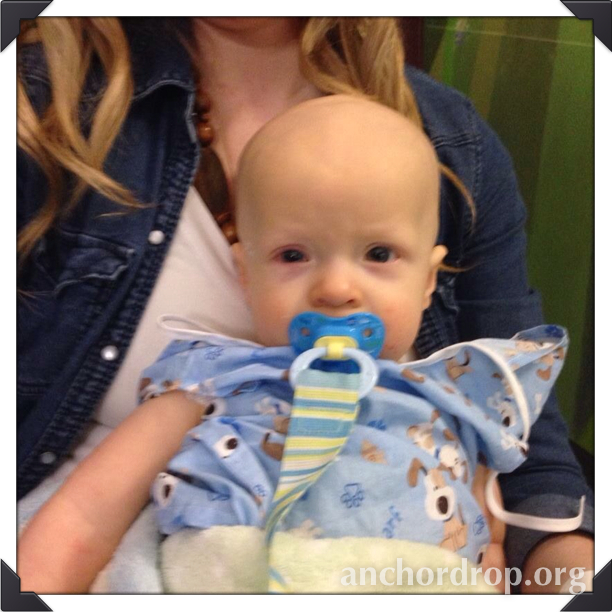 God has brought Charlie this far, so why wouldn’t he continue to work in his little life? So we continued to patch, but I needed an attitude adjustment with it. Patching was something I dreaded because Charlie didn’t enjoy it, and it’s unbelievably difficult to keep an eight month old engaged for a couple hours a day when he can’t see. I tried new things everyday to stimulate his other senses, but I was definitely running out of ideas. I was reading one morning in my devotional, “Jesus Calling” (highly recommend!) and it challenged me to thank God for the very things that were troubling me. Patching immediately came to mind! It hit me that I really should be thankful for the very opportunity to patch Charlie’s eye – just 6 months ago we were given a 0% chance of saving his eye. Six months ago the idea and patching and the possibility of having vision let alone an eye were out of the question. How sad that I quickly forgot how far God has brought us. This “light-bulb” from God changed my perspective, even though patching still was a challenge. A few days later while patched Charlie smiled at Scott’s silent silly faces! He then reached for a remote! This was another complete miracle! For over two weeks Charlie was blind in that eye, and now he could see! To this day we still patch, and I can’t say it’s an enjoyable experience. Charlie now can rip the patch off in less than a second, so he requires a very close eye while patching. However, he will “play” golf while patched! It’s truly, truly a miracle, and we are indescribably grateful! February brought another eye exam under anesthesia, but this time a new small tumor popped up. Thankfully, the tumor was small enough that the Dr. could take care of it with cryotherapy, but this was a discouraging set back. You see the last day of Charlie’s chemo back in December I kind of thought cancer was now in the past – not something that we were still fighting. How naive. He had an eye exam in March and May which both came back clear, and another one in July which came back with another tumor in the peripheral. Once again it was small enough to have cryotherapy done, but still discouraging. We went back on September 2nd for another exam and it was clear! We were so relieved and grateful for the good news. We will go back yet again in November, and be praying for clear results! So, as you can see from our story that while it has been a really difficult time, we also have SO much to be grateful for. You see retinoblastoma has the highest survival rate (95-99%) of all pediatric cancers. A lot of kids lose their eye(s), but most survive. While at times I worried about whether or not Charlie would survive this – we had hope, a lot of it. When our Dr. diagnosed Charlie he told us he would survive. I can’t say I believed him 100%, but it was hope – something that a lot of other parents of children with cancer don’t have. Also, even though we’ve had two new tumors pop up, we’ve been so fortunate that they have all been in the peripheral so they have not effected his vision. Almost all of a persons vision comes from a small central focal point in the eye. If a tumor would have popped up there with cryotherapy the vision that he does have in that eye would have been destroyed. So while we have received bad news along the way, it’s always been the best of the bad. Like I said, a lot of kids and families are not as fortunate as we are. A lot of other children’s stories don’t sound like Charlie’s. Their treatments are a lot more aggressive and a lot longer. Yes, a lot of kids survive childhood cancer, but a lot don’t. I’ve seen it first hand. There was a little 7 year old girl that we have seen, and got the honor of meeting at several pediatric cancer events. The latest event I saw her at was at a camp for kids with cancer (Camp Watcha Wanna Do). She was in a wheelchair, incredibly frail, bald, and had hearing aides (some chemo drugs can permanently damage hearing). It was an 80 degree day and she was bundled up in a quilt. She was sweet and definitely enjoying herself at camp. Two weeks after camp I got word that she had passed. During this time I learned that this sweet girl had been battling cancer for 6 years-her whole life. 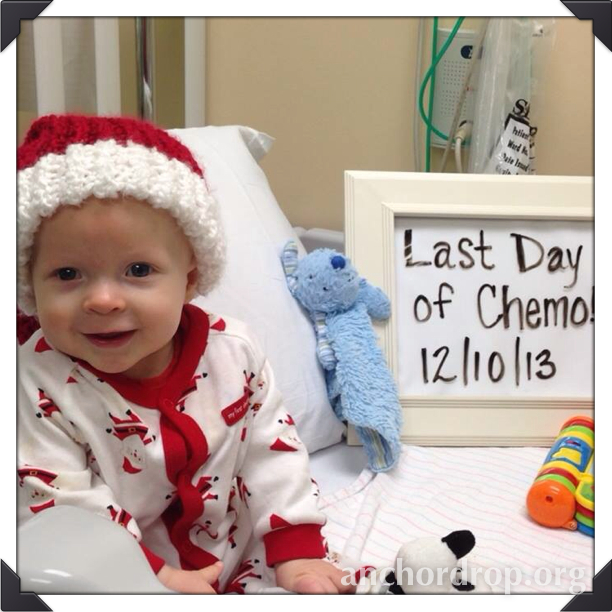 A short while later I called our pediatric oncology unit in Fort Wayne to let them know of Charlie’s newest tumor. While speaking to the nurse, we both sobbed on the phone. They as an office had 2 patients of theirs that had died that month and the nurse said she didn’t know how much longer she’d be able to continue working there, and trust me this nurse has a gift! She was angry – understandably. So was I. These kids deserve better – they deserve to be kids. And yes, like I said, a lot of kids survive, but not without battle wounds – a lot of retinoblastoma kids lose one or both eyes. I’ve gotten to know a little 7 year old Amish boy who lost part of his leg due to a bone infection while he was receiving treatment for Leukemia, which by the way for boys is 3 years long! And that is just the physical effects (which there are many more) not to mention the emotional and intellectual effects that these harsh treatments that will last the rest of their lives. This is why supporting/funding research for pediatric cancer is so important. It matters. For example, just a few years ago neuroblastoma was a death sentence. Now, kids are surviving, and it’s because of research. 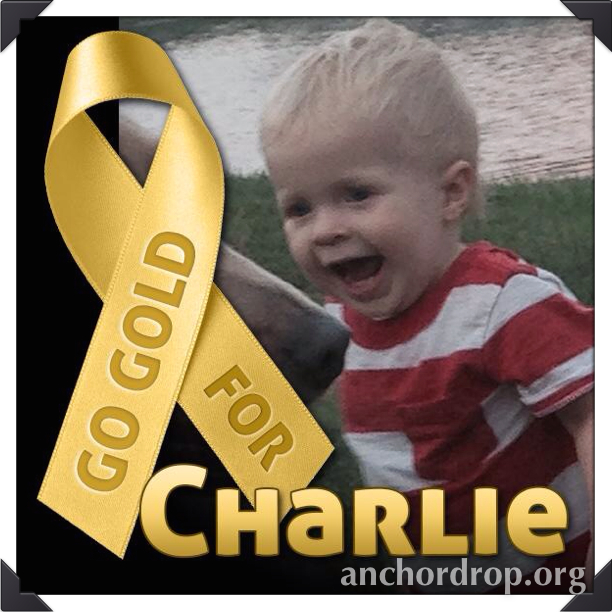 I admit I was ignorant to childhood cancer prior to Charlie’s diagnosis. I would turn the channel when a St. Jude’s commercials came on because it made me too sad. But their sadness is reality, and they need people to come along side of them and fight because they can’t do it alone. Below are some links for donating if you feel led to do so. Thanks for reading our story, and we welcome prayers for our little hero. Week 3: Weigh in and Don’t forget the Cheese Puffs!! !